Every year in the U.S. around 12,000 people die from heroin overdoses. That’s around 32 people a day. And though to me and you those numbers are probably just some sad meaningless statistics, those 32 people that died today, and yesterday, and all of the days before them – they’re mothers and fathers, sisters and brothers, and friends who just couldn’t get away from the crippling addiction that is heroin. This is just one of those moments as a father tells his son that his mother died last night after a fatal heroin overdose, reports the Daily Mail. 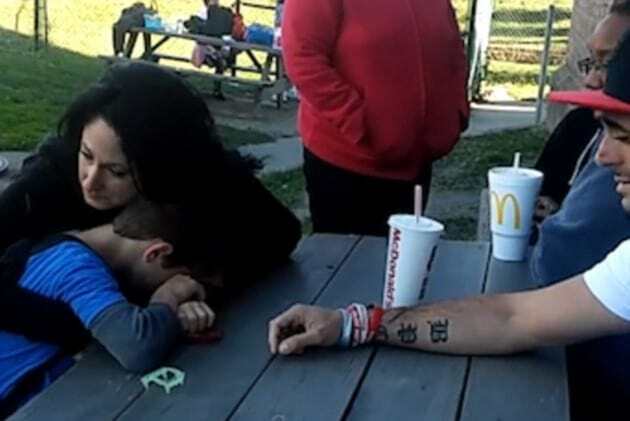 The video shows Mr. Brenden Bickerstaff-Clark sitting at a wooden picnic bench in Ohio with a friend and his young eight-year-old son, Cameron. He holds his son’s hand as he tells him how his mum died the night before. The son can’t quite grasp just what has happened at first before eventually breaking down into tears as his dad tells him that it was drugs that killed her. ‘I have something to tell you, OK?… Mommy died last night’. ‘What? What do you mean, my mom? How?’, asks Cameron. Bickerstaff uploaded the video to YouTube in an attempt to show the world just how destructive heroin can be to all of those affected. This is for any and every addict with children. Today I had to tell my 8 year old son that his mommy died from a drug overdose last night. This is the realization and reality of our disease. Don’t let this disease have to make someone tell your child that you’re dead because of drugs. This was one of the hardest things I’ve ever had to do. My son has no mother because of heroin…kinda hard to hear but u can hear what we’re saying. Please get help so our children don’t have to suffer. However the video has been bombarded with criticism with people calling out Bickerstaff for putting his son’s emotional breakdown online for all to see. The video was shot in Youngstown, Ohio – a rust belt city which has been devastated by heroin abuse. I guess it’s easy for an outsider to point fingers at drink and drug addicts and to say that they shouldn’t have touched the substances in the first place. But what isn’t so easy for the majority of people is to understand just how destructive and how compelling such substances can be. Nobody intends to become an addict. You don’t wake up one morning and decide to be a drug addict. It took me almost six months to get my first habit, and then the withdrawal symptoms were mild. I think it no exaggeration to say it takes about a year and several hundred injections to make an addict. The questions, of course, could be asked: Why did you ever try narcotics? Why did you continue using it long enough to become an addict? You become a narcotics addict because you do not have strong motivations in the other direction. Junk wins by default. I tried it as a matter of curiosity. I drifted along taking shots when I could score. I ended up hooked. Most addicts I have talked to report a similar experience. Junk wins by default. You don’t decide to be an addict. One morning you wake up sick and you’re an addict.